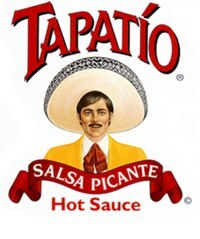 Tapatío is a hot sauce, produced in Vernon, California. It is popular across the United States. "Tapatío" is the name given to people from Guadalajara, Jalisco: the company's founders come from Guadalajara. It is exported to Mexico, Canada, Central America, Australia, and elsewhere. The ingredients, as listed on the product label, are water, red peppers, salt, spices, garlic, acetic acid, xanthan gum and sodium benzoate as a preservative. Tapatío comes in five sizes: 5, 10, and 32 fluid ounces, and 1 gallon (3.785 liters), as well as in 7-gram packets. The sauce overall has a Scoville heat scale rating of 3,000, hotter than Sriracha. The product slogan is "Es una salsa ... Muy salsa" (very saucy"). In 2011, Frito-Lay released a line of Tapatío-flavored Doritos, Ruffles, and Fritos in the United States. ^ "Ultimate Guide to the Best Hot Sauces". Supergirl. March 30, 2017. Retrieved 16 September 2017. ^ Doritos Tapatío. Frito-Lay Product Page. ^ Ruffles Tapatío Limon. Frito-Lay Product Page. ^ Fritos Tapatío. Frito-Lay Product Page. ^ Press Release on new Frito-Lay Tapatío Hot Sauce Flavors. Frito-Lay Press Release Archive. ^ Tapatio Hot Sauce|Es una salsa...Muy salsa. Accessed January 2017. This page was last edited on 12 December 2018, at 22:58 (UTC).